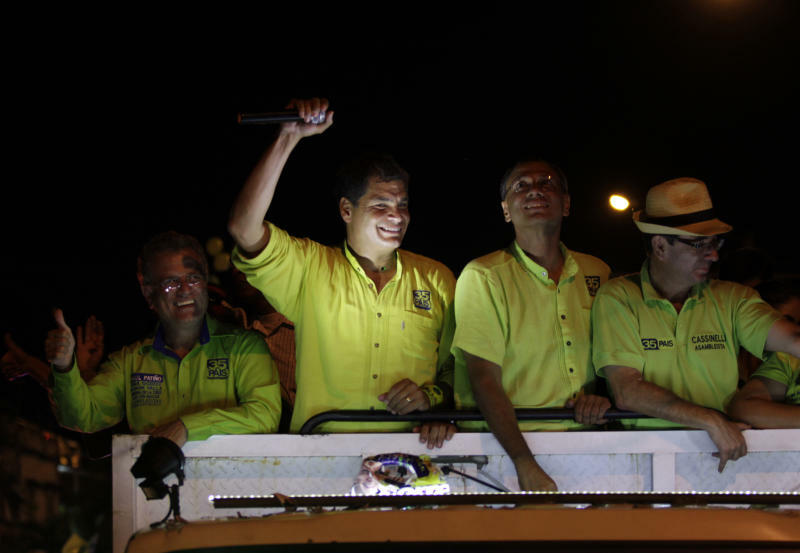 QUITO, Ecuador (AP) — On a campaign stage, Rafael Correa is a dancing, singing, swirling tornado of energy. Ecuador's president doesn't make promises. He's way past that. With characteristic bravado, Correa instead reminds the enthusiastic crowd in a northern Quito suburb of the nearly 5,000 miles (8,000 kilometers) of highway he's improved, of the schools and hospitals built during his six years in office. Loathed by civil libertarians and free-market champions, but embraced by beneficiaries of state largesse, the leftist economist appears ready to coast to a second re-election on Sunday. Correa, 48, has brought political stability to a traditionally unruly nation that cycled through seven presidents in a decade, from 1997-2007. If re-elected, this four-year term will be his last unless the constitution is changed. Correa's "21st-century socialism" is a tamer variation of that practiced by Venezuelan President Hugo Chavez. Yet Correa has been just as intolerant of dissent as Chavez, keeping a tight lid on public discourse and the press. Meanwhile, Correa has overseen Latin America's most generous public spending regime, keeping his support high by introducing low-interest mortgage for new homeowners, state-bankrolled study abroad and welfare payments that now reach nearly one in five Ecuadoreans. 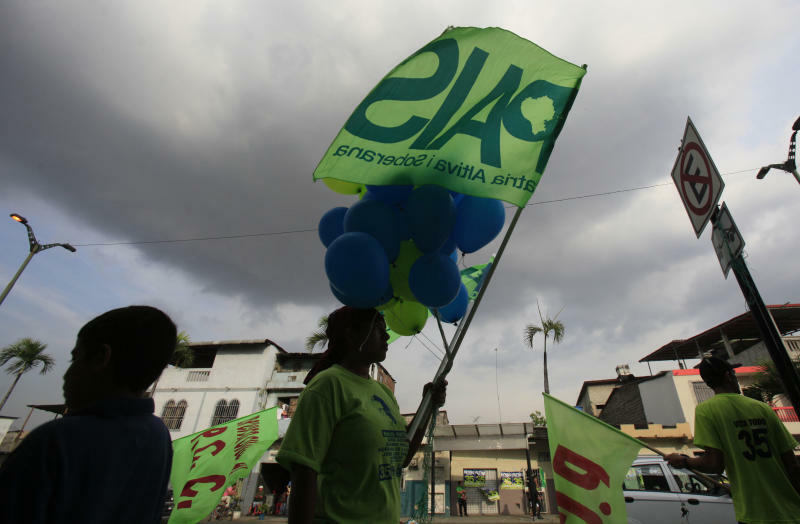 The bulk of his backers are poor and lower-middle class Ecuadoreans who in 2010 represented 37 and 40 percent, respectively, of the country's population according to the World Bank. Correa doesn't take those supporters for granted. Every Saturday and a few nights a week, Correa pre-empts commercial TV and radio stations to spread his "citizen's revolution" and verbally skewer his "oligarch" enemies. It's the kind of prerogative of power wielded regularly by Chavez's government and Argentina's president, Cristina Fernandez. Opposition journalists, meanwhile, have been slapped with criminal libel charges for calling Correa a dictator. Indigenous leaders have been prosecuted for sabotage for protesting the government's refusal to consult with native peoples over water rights and its insistence on opening Ecuador to large-scale precious metals mining. Correa has set back the rule of law two decades by packing the courts with loyalists and politicizing them, said Grace Jaramillo, an Ecuadorean political scientist studying in Canada. "Without an independent judiciary, anyone who opposes the government runs the risk of becoming prey," Jaramillo said. Human rights groups including Amnesty International say Correa has criminalized peaceful protest. Yet only a handful of activists could be considered political prisoners, and they get scant local attention. The media instead has focused most of its attention on Correa as the number of news organizations in state hands has grown under his leadership from just one, Radio Nacional, to five television stations, four radio stations, two newspapers and four magazines. Correa also typically draws a lot of attention from supporters, with a crowd of 5,000 fixated on the tall, dynamic leader at the January rally in northern Quito. "Do you want the old country of school and hospital strikes to return?" the president asked in a typical call-and-response exchange. "Do you want a country run by the very people who ruined the country? "You know that here are the people who have always kept their promises, who will never fail you," Correa said. Veronica Bermudez, a 53-year-old housewife at the rally, is among the enthusiastic supporters. "He gives us money. He gives us free health care. He worries about the education of our kids," she said. "How can I not love him?" In all, 1.9 million people receive $50 a month from the state: single mothers, the elderly poor and needy families. Children get free school supplies and uniforms. Medical care at public hospitals, including medicine, is free for poor people. The state handouts have helped keep Correa's popularity rating high. Currently, it stands at 56 percent. Heading into the election, opinion polls show Correa leading a field of seven candidates with at least 40 percent of the vote. 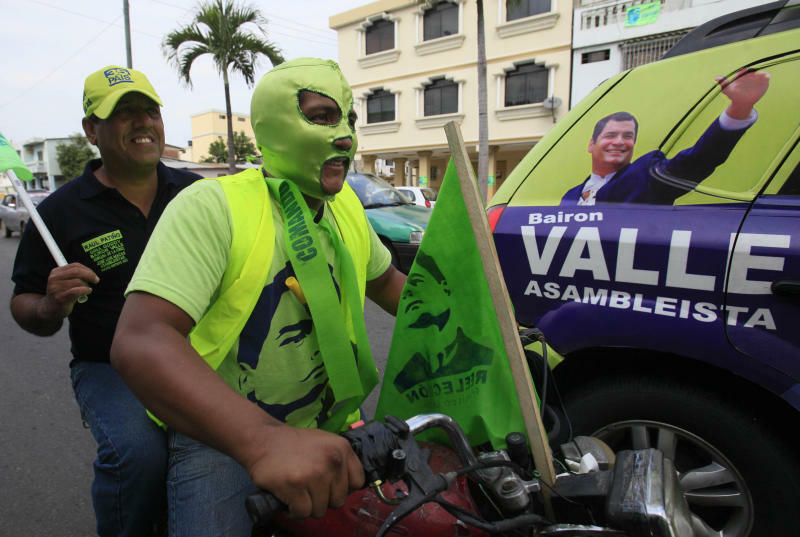 His closest opponent, Guillermo Lasso, has not achieved 20 percent support. Lasso, who stepped down as executive president of the Banco de Guayaquil to run against Correa, says he would lower taxes on job-creating companies and abolish a 5 percent tax on capital removed from Ecuador, one of a slew of tax reforms enacted under Correa that has discouraged foreign investors and weakened banks. But at the same time, unemployment has dropped from 9.82 percent when Correa took office in January 2007 to 4.71 percent in November, the latest statistics available. Economic growth, meanwhile, registered 5.2 percent last year. Oil prices hovering around $100 a barrel have been a blessing for Ecuador, where petroleum resources have accounted for more than half of the country's export earnings in recent years. Petroleum revenues have contributed $5 billion a year, or 20 percent, to the national budget. That allowed Ecuador to lead the region in 2011 in public spending as a portion of gross domestic product at 11.1 percent, according to the U.N., with Bolivia following at 10.8 percent. While spending on social programs has kept many Ecuadoreans happy, Correa has been dogged by an inability to ease an increasing sense of vulnerability to crime. And he has been criticized by rights groups including the Inter-American Commission on Human Rights for blunting the influence of opposition parties, the Roman Catholic Church and the banking industry after pushing through a 2008 constitutional rewrite that let him overhaul the government. An additional law barred private news media owners from owning stakes in other industries. A virulent critic of bankers whose profligacy led Ecuador to near ruin in the late 1990s, Correa has also defied international financiers, defaulting on $3.9 billion in foreign debt obligations after taking office. He has also kept the United States at an arm's length, and upset Britain and Sweden in August by granting asylum at Ecuador's London embassy to WikiLeaks founder Julian Assange, the online spiller of leaked U.S. government secrets who is wanted for questioning in Sweden for alleged sexual assault. Correa has chosen instead to cozy up to U.S. rivals Iran and China, the latter of which is Ecuador's chief oil purchaser and holds $3.4 billion in Ecuadorean debt, according to Finance Minister Patricio Rivera. Correa's only serious crisis has been domestic: A one-day Sept. 2010 revolt by police over an attempt to trim their benefits. At least 12 people were killed, and Correa was rescued by army commandos from a hospital where he had been ringed by insurgent officers. The enduring image of that day was of Correa, standing at a window and baring his chest to the police, daring them to kill him. Such boldness has helped cement his popularity among people such as Manuel Sigcha, a 26-year-old Quito kabob vendor. "He is the best president we've had in my lifetime," said Sigcha. "I will vote for Correa until I die because he's the only one who has remembered the poor, the only one who has done things for the poor."